Hal Leonrd som ger ut notböcker har nu kommit ut med en trumbok så att man skall kunna lära sig att spela efter KISS. 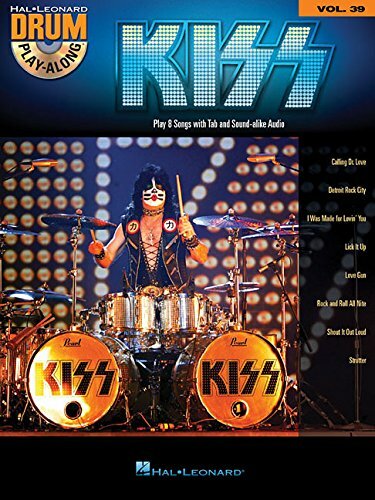 Hal Leonard Drum Play-Along med Eric Singer finns nu att beställa på Amazon. (Drum Play-Along). Play your favorite songs quickly and easily with the Drum Play-Along Series . Just follow the drum notation, listen to the CD to hear how the drums should sound, then play along using the separate backing tracks. The lyrics are also included for quick reference. The audio CD is playable on any CD player. For PC and Mac computer users, the CD is enhanced so you can adjust the recording to any tempo without changing the pitch! Includes: Calling Dr. Love * Detroit Rock City * I Was Made for Lovin’ You * Lick It Up * Love Gun * Rock and Roll All Nite * Shout It Out Loud * Strutter.